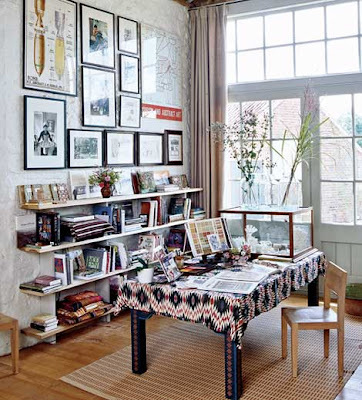 It seems that a particular type of architecture that one prefers is often linked to where they lived as a child. For much of my youth, I lived in a former sea captain's Federal style home set on a hill overlooking Port Jefferson Harbor. 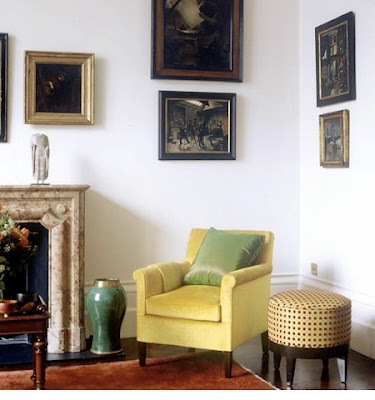 It was a little home and in need of some refurbishing, but filled with many proper details such as fireplaces in many of the rooms and the original paneled library. 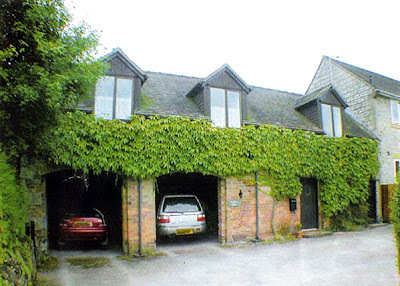 Prior to that home, for several years we lived in the tiny hamlet of Mt. Sinai, Long Island on a piece of property with three homes. Our home was originally the barn on the property that had been converted to a home by a Stony Brook professor and his wife. 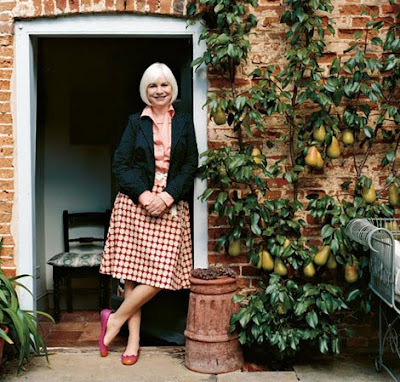 It was a unique space for my mother to create our nest, and with the open kitchen plan and exposed beams it had a relaxed, modern feeling similar to homes today. 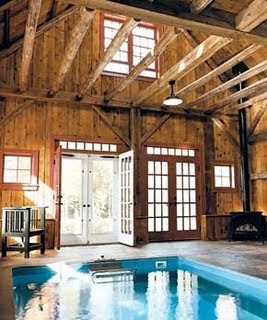 I have fond memories of living there and when I hear of people converting barns to homes, my interest is always piqued. Both of these childhood homes taught me a respect for historical architecture. Living in New York City for almost twenty years, I have come to appreciate the architecture in this great city. The history of New York runs rich with the inception of our country pumping through its veins. The more I learn, the deeper my appreciation goes to the architects and builders that helped create this magnificent city. Many aspects of our lives including music, art, literature and architecture reflect the climate of our society's economic times and mindset. During the Gilded Age of the late 1800s there was an economic surge, and in turn the architecture flourished with great details and grand homes using expensive materials. 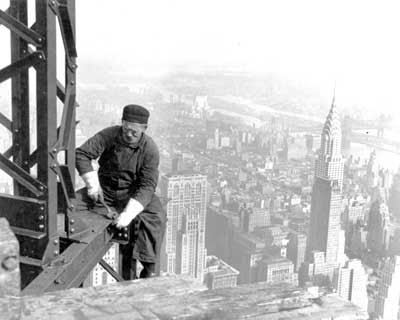 By contrast, in the years of the Great Depression that followed, the lack of funds and resources influenced the architecture; however, the builders of these times tapped into the new technology of using steel framed construction and their own determination to leave their important mark in New York City. 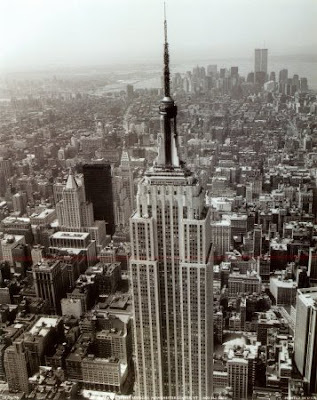 An example of this is the the Empire State Building which started construction in 1930 and surprisingly took only one year to complete, with a ribbon cutting opening ceremony on May 1, 1931. It is important to note that the construction of Rockefeller Center during the Depression employed thousands of workers. It seems that during difficult times, there is more effeciency and expediency due to the immediacy of our needs. Many architects and builders had such great abilities and vision in times before the engineering and technological advantages we are blessed with today. New York's culturally diverse heritage can be read in the lines of its architecture, from the Dutch colonial homes of the 1600s through the Neo-Classical, Neo-Gothic, Greek Revival, Italian Renaissance Revival, Beaux Arts Classical, Italianate and Art Deco styles. 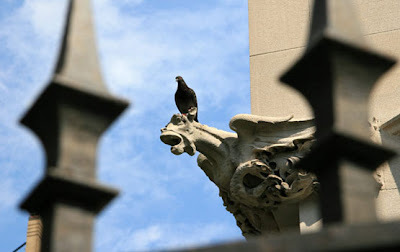 New York architecture is a historical journey into what brought us to this complicated urban mileu that we see in 2009. So much occurred historically and architecturally during the period of 1870 through 1940, and those 70 years and ideologies still influence us today. 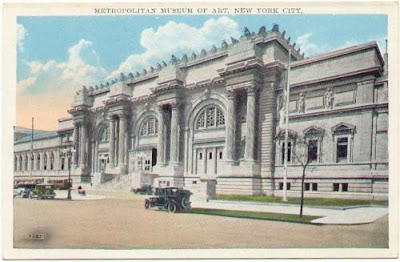 During the Gilded Age, the debut of the Metropolitan Museum in 1877 helped to shape the neighborhood as the new fashionable address above 57th Street. Looking back at the extraordinary changes this period brought about for decades to follow, one can't help but wonder what influences our times will bring to this city in the years ahead. What better time than now to celebrate the magnificence of this great city, because quite frankly New York may need a proverbial pat on the back right now. In recent years, the City has suffered some trials and tribulations, beginning with the tragedy of the World Trade Center in 2001 to the most recent Wall Street restructuring. As we sit on the precipace of a difficult time, it is comforting to remember that we came out of those dark days with a deep pain in our side, but resilient and determined. I guess I am an optimist because I feel confident that some solutions to our country's problems will come from the walls of our City as it has done many times before in history. All one must do is take a stroll down virtually any New York street and within every nook and cranny the foundations that our ancesters built are evident. The hard work, ingenuity and determination are illustrated in all the various neighborhoods. 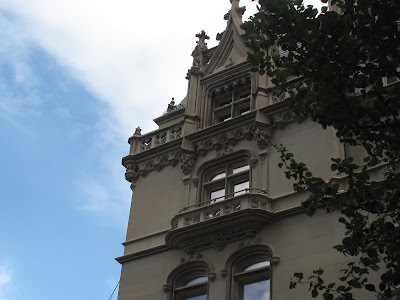 For October's blog, I will take you on a Carnegie Hill architecture walking tour, albeit a short one because it could take weeks to fully cover this subject. I plan to showcase some architects who have left their mark, some I know personally, while others I will reference posthumously. 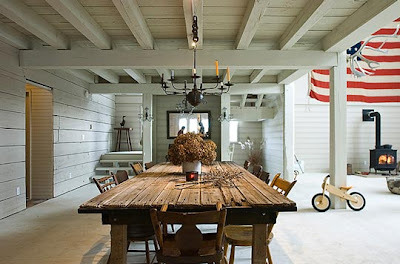 And, finally, to add some whimsy I have combined some interesting shots of barns, and barns converted to homes. I hope you will find this as inspiring to read as I did putting it together. Enjoy! The area around the Metropolitan Museum of Art (the "Met") showcases a variety of building styles, from late 19th-century brownstone homes to mid-20th century apartment buildings. Much of the development began in the area in the late 1860s with the construction of several rows of brownstones in the Italianate style on 78th-81st Street. 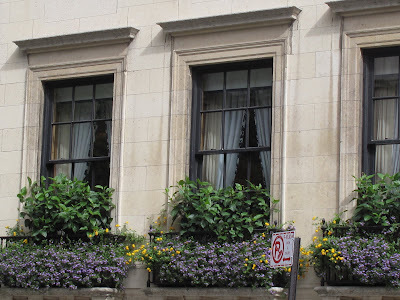 Near 79th Street is the finest collection of turn of the century town houses in New York. By the end of the 1890s several large elegant mansions had been erected on Fifth Avenue. By the early 1900s many of the brownstones were replaced with large mansions, and primarily built in the Beaux-Arts and neo-Renaissance styles. 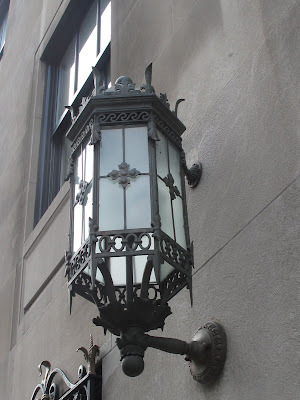 The Met itself was opened in February 1872 and was designed in a neo-classical style by a variety of architects from the years 1864-1990, including famous architects, like Calvert Vaux, Richard Morris Hunt, McKim Mead & White, and Kevin Roche. 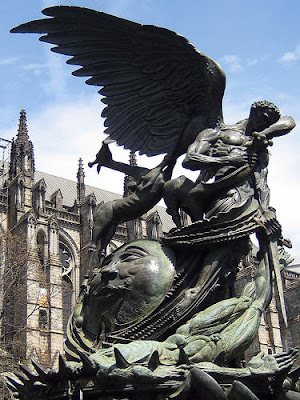 The Cathedral of St. John the Divine is an extraordinary example of architecture in New York City history. Sadly, the project, started in the late 1800s, was never fully completed. Columbia University moved from its midtown location, and in constructing the Cathedral many had hoped it would become the crown jewel in this Morningside Heights community. Unfortunately, this neighborhood did not become the next hotspot in Manhattan due partially to the recent elevated line that had been constructed on the West Side, and had been built in such a way that it missed Morningside and stopped in Harlem instead. 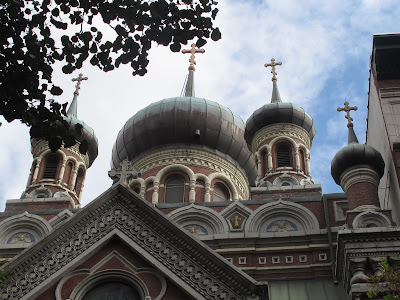 Heins and Lafarge designed the Cathedral in the Byzantine and Round-Arch Romanesque style, and in the manner of the Medieval castles of Europe. This massive, detailed structure was the length of two football fields, with a 120 foot high ceiling. The structure completely supports itself with an authentic Guastavino vault. Many cathedrals in the U.S. are simply stone stacked around a modern steel skeleton. These impressive European structures took lots of money and many years of construction. 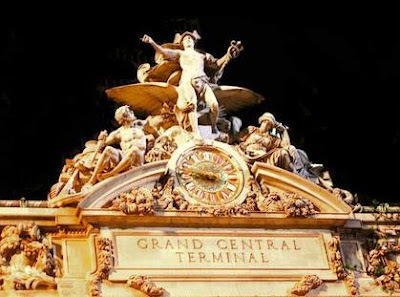 Grand Central Station has gone through many face-lifts and more substantial changes, however, the most recent refurbishing has left it the shining star in New York. The original Grand Central Station, a 100-foot wide by 650-foot long structure, rivaled the Eiffel Tower as the most dramatic engineering achievement of the 19th century. 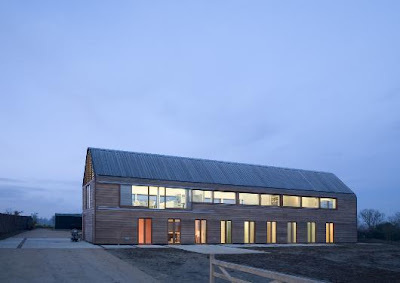 It was glass and steel and featured a "classical" façade. Noise, pollution and safety were growing issues in New York when a train collision on January 8, 1902 in the Park Avenue Tunnel killed seventeen people. Soon after, an expansion began utilizing electric trains. It was a new double level terminal and a considerable upgrade from before. 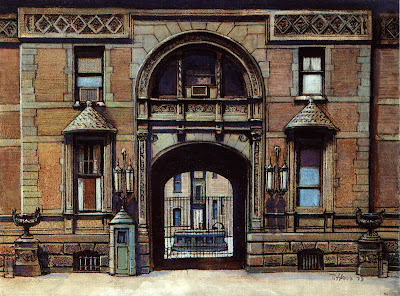 This firm was considered cutting edge during the late 1800s because they were one of the first architectural firms to use various architectural styles within one residence or building, creating a unique American style of architecture. Charles McKim, William Rutherford Mead and Stanford White established their partnership in 1879. 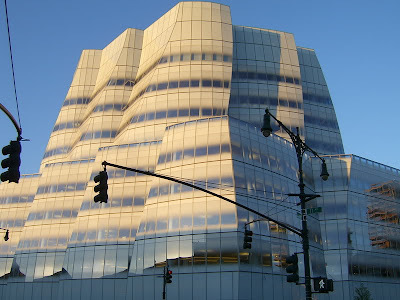 During this time period, they became the most prestigious architectural firm in the United States. They designed residential, institutional, commercial, and public buildings in New York and other cities. Their contribution to New York is significant. One of the most most important buildings designed by the firm is the Municipal Building (1907–14) on Centre Street at Chambers Street. This prominently sited Classical Revival building, dating from 1907–14, was commissioned to house City offices. The firm also designed Madison Square Garden, The Spanish Institute, First Presbyterian Church, Pennsylvania Station, Savoy Plaza Hotel, The Tiffany & Company building, The Harvard Club, and The Metropolitan Museum of Art. Before starting their firm, McKim and White studied under Henry Hobson Richardson. 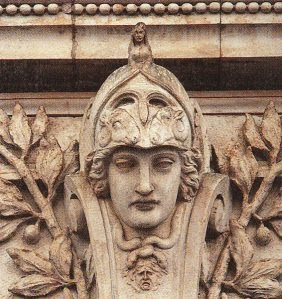 Henry Hobson Richardson was associated with the City Beautiful and Beaux Arts movements, which focused on cleaning up the confusion of American cities and instilling them with a sense of order and formality. The firm was fortunate to have grown up in the prosperous and peaceful times during the Gilded Age. They established themselves as the premiere architectural firm for the wealthy, and in addition to building many prominent mansions for John D. Rockefeller, J.P. Morgan and Andrew Carnegie along New York's Fifth Avenue, they built their reputation on designing a particular style of weekend mansions in Newport, Rhode Island, and in parts of Long Island and New Jersey. 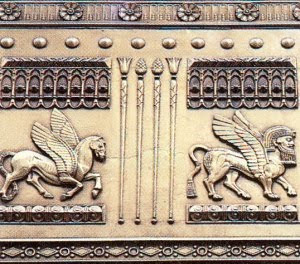 The opulence was evident in the flagrant way in which the wealth was showcased during this era, and the great details and use of elaborate materials can be seen in their work. They helped to establish the gambled roof, cedar shingle homes that are associated today with upscale country-style living. Stanford White was born into a life of wealth and privilege in 1853, the son of a Shakesperean scholar and essayist. He had quite a dark side to his personal life, but that is for another edition of my blog. He was a talented draftsman. His career was diverse and Stanford designed many summer homes for New York society such as the Astors and Vanderbilts. 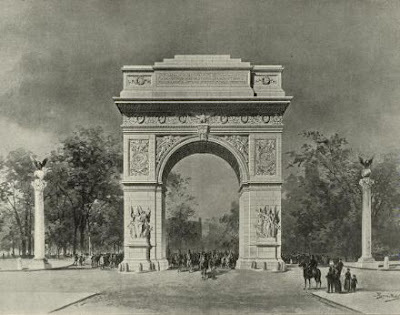 He was responsible for the The Washington Square Arch, Madison Square Garden and the New York Herald Building. Andrew Carnegie's former mansion is now the Smithsonian Institute's National Design Museum. 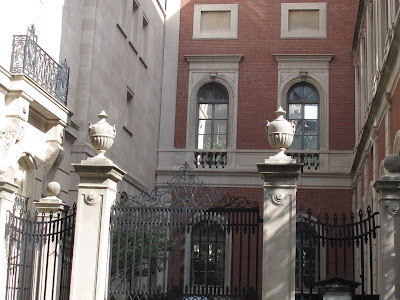 It has handsome gardens and a lovely brown-brick exterior with granite pillars, and takes up half the block on 91st Street between Madison and Fifth Avenue. The Beaux Arts style building has a large wood-paneled central hall and grand staircase. 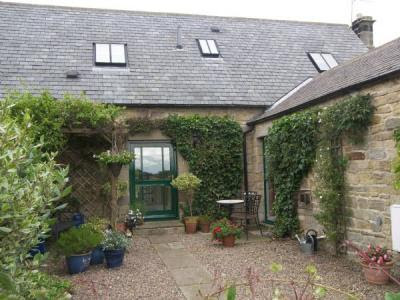 It houses a lovely conservatory and garden. The original design was by Babb, Cook & Willard in 1902. Andrew Carnegie wanted a large but modest house, and when completed it had 64 rooms. Mr. Carnegie was one America's wealthiest men at the time, and acquired his fortune in steel. The garden was designed for his retirement pleasure by Schermerhorn & Foulks. Many of the grand homes at the time were done with marble and limestone, so this home was considered modest due to the brickwork. The Carnegie Corporation donated the house to the Smithsonian and architect Hugh Hardy designed the sensitive museum conversion completed in 1976." 1929 marked the beginning of the Great Depression, so during the decade between 1920 and 1930 our country went through many changes. 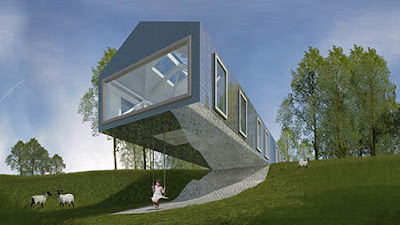 A new style of architecture and design developed called Art Deco. 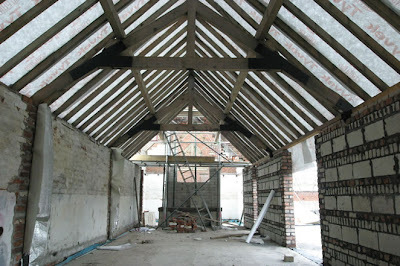 The emphasis on steel framed building also added to the unusual style and substance of the construction during the period. 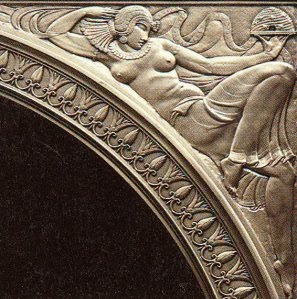 Although Art Deco has been attributed to buildings from the 1920s through the 1940s in New York City, Art Deco growth happened in a shorter time, primarily from 1928 through the 1930s. New York City has some beautiful examples of Art Deco architecture, partially because during the Depression only the largest cities could afford new building projects. With Art Deco came a new way of perceiving design, and many of the city's architecture before Art Deco was reminiscent of earlier periods, such as Neo-Classical, Neo-Gothic, or Greek Revival, but this new style brought fresh ideologies of tall, angular and sculptural to building. The Chrysler building, Rockefeller Center, Radio City Music Hall and the Empire State Building are a few key buildings that were built in this short time and reflect the use of Art Deco and the new approach to skyscrapers, which permanently changed the New York skyline. set on the very quiet sidestreet of 97th between Fifth & Madison is this beautiful cathedral. 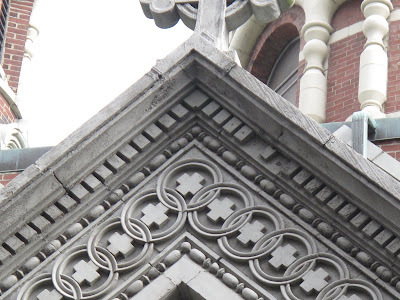 The inside is incredibly ornate and the detailing is reminiscent of European cathedrals. It seems in pristine condition. The looming, ornate building, originally owned by Felix M. Warburg Mansion and built from the years 1906-1908, is now a National Landmark. Mr. Warburg hired architect Jacob Ruppert to build this large mansion in the french gothic chateau style. 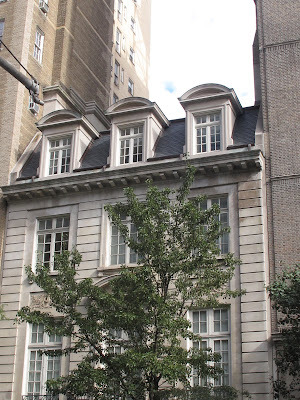 The Warburg family donated the home to the Jewish Theological Seminery for its Jewish Museum in 1944. 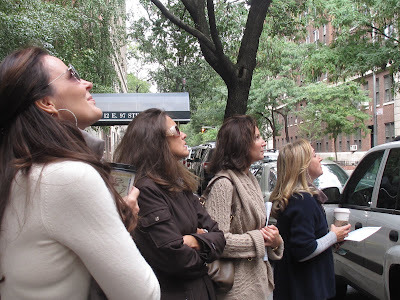 It was a blustery day in Carnegie Hill during the last day of September, when I met up with a few of my close friends for a "walking tour" with Alfred Pommer of New York City Cultural Walks. The seven of us have lived in the neighborhood for many years, so it was quite a familiar spot for us, however, within a few minutes of beginning our walk it became apparent that these same streets that we often rush through for our daily activities offer a splendid opportunity to learn about our culturally rich history. All we simply had to do was slow down, look up (something New Yorkers very rarely do for some reason) and take in the seemingly boundless information that Alfred provided to us about the infamous Gilded Age of the late 1800s through the turn of the century. 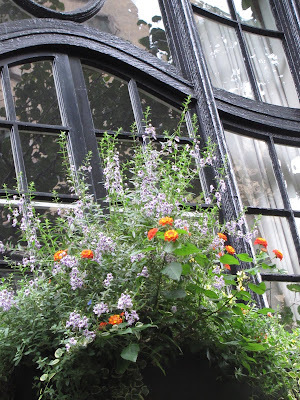 Arthur filled us in on many details of these mostly private residences that were originally owned by some of New York's most prominent families during the turn of the century. The area known as Carnegie Hill was orignially blocks of land that were bought by Andrew Carnegie in 1898 (prior to that the area had been in a bit of disarray and occupied primarily by breweries, immigrant squatters and charitable institutes for indigent people). Mr. Carnegie sold parcels of his land between 86th street and 96th street on Fifth Avenue to friends and family that he wanted as neighbors. 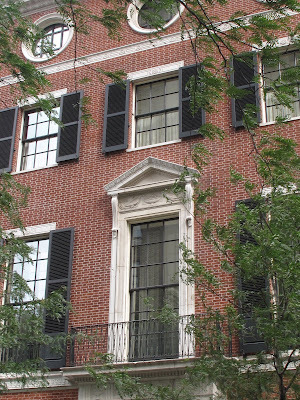 He had a large brick facade mansion built as his retirement home, which is now the Cooper Hewitt Museum. 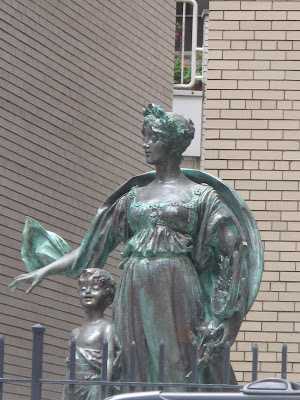 This helped to establish this neighborhood as one of the premiere neighborhoods in Manhattan. Alfred's stories were a lovely uniting of the past with the present through history, architecture, pictures and stories. We stopped at several national and New York City landmarks along the way. 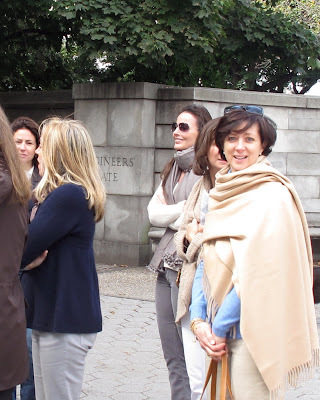 As we meandered from 97th and Fifth Avenue and finally stopped in front of Frank Lloyd Wright's famous project, the Guggenheim Museum, we had traveled through seventy years of New York history in a ten block span. Along the way we explored the architectural significance of Beaux Art buildings, Neo-Federal, Neo-Georgian, Queen Anne, Italiane, and Second Empire, and as Arthur explained, a unique-to-American-style that grew out of this era of combining all these varying architectural styles together. Many of these homes were originally mansions that took up almost entire blocks, and most have now either been donated to museums and charitable organziations, or turned into cooperative apartments. The good news is that many still remain, albeit in an altered state. During the Great Depression when the building of skyscrapers became an important part of the city skyline, some of these grand homes were sold and destroyed. To name a few that we saw - the Lucy Dahlgren Mansion on 96th Street, The Edith Fabbri Mansion from 1916, architect Otto Kahn's Mansion and other homes he designed from 1912-1918, row houses on Madison Avenue, The Church of the Heavenly Rest, Andrew Carnegie's country home on 91st Street, The Saint Nicholas Russian Orthodox Cathedral in 1909, and many more. We laughed, walked, talked and soaked in the information from Arthur on the many details of this beautiful neighborhood. I certainly will remember to look above the doorframes more often and notice the accoutrements that adorn this City's gems. I am thankful to all the people that I have not met that helped to preserve what is left in New York. 41 East 57th Street at Madison Avenue, 11th floor. Richard has had many solo exhibitions over his career, as well as permanent collections at some fine institutions such as; American Academy of Art, The Metropolitan Museum of Art, The New York Historical Society, the New York Public Library, The Smithsonian Institution, The Whitney Museum of American Art and Yale University Art Gallery to name just a few. 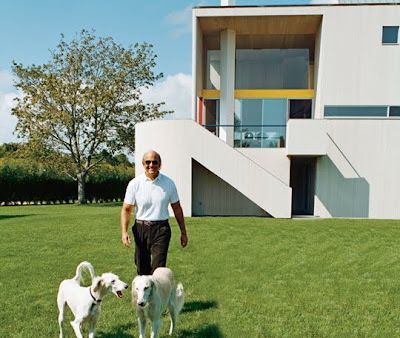 architect Charles Gwathmey in his long island home Charles Gwathmey in front of Amagansett home courtesy of Dan’s Papers I was saddened to hear of the passing of Charles Gwathmey who put his aesthetic stamp on the "high Modernist" style. 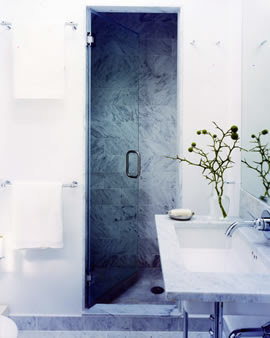 His firm Gwathmey, Siegel & Associates has followed in the Le Corbusier styles of the early 20th century. 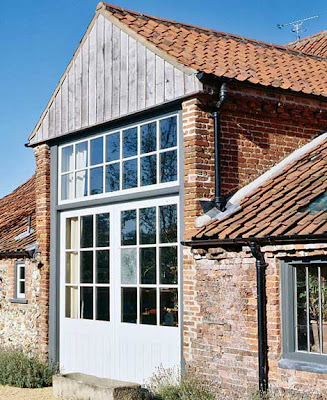 I have added random but beautiful images of various barns, some old, some converted to homes, and some with a very modern twist! Hi Tamara! How funny that as I was reading the beginning of the post I was going to comment about the architecture in Port Jefferson ~ and imagine my surprise that you mention it! I can't tell you how many times I see people strolling in the village taking pictures of the gorgeous architecture of these buildings. Second ~ I live in Mount Sinai! 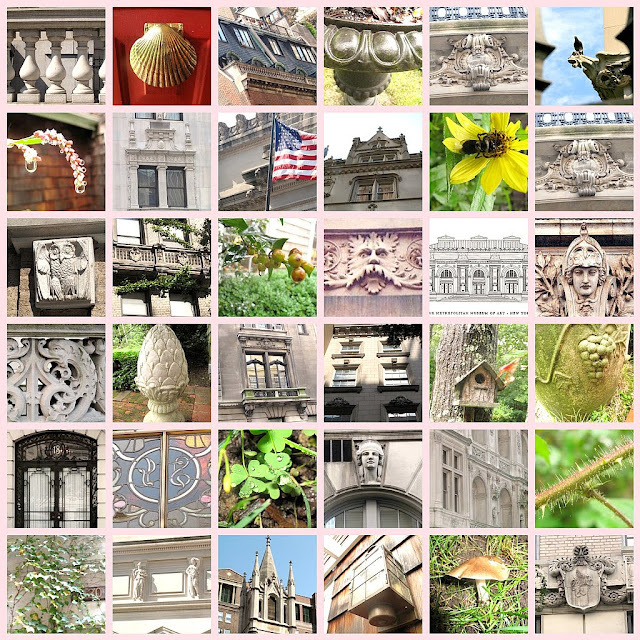 You've given so many great inspiration pictures of the beautiful architecture that abounds in New York. Great post! Wow...I had only posted the blog for a few minutes when you posted your comment. I love both Mt. Sinai and Port Jeff as you can tell from my comments, and I was astounded when I recently took my children by my old home to note that many of the homes I knew growing up are now adorned with plaques from the historical society. That lovely little enclave around the water is preserved in time - and Kathy you are so lucky to live there still! Love your October subject! You show wonderful pics, with explanation so relevant. 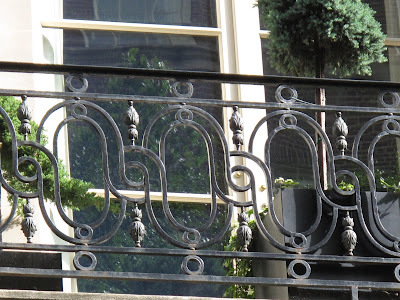 We need to appreciate the architecture all around us - there is so much inspiration there!